"When you can’t beat the odds, change the game. Kaz Brekker and his crew have just pulled off a heist so daring even they didn’t think they’d survive. But instead of divvying up a fat reward, they’re right back to fighting for their lives. Double-crossed and badly weakened, the crew is low on resources, allies, and hope. As powerful forces from around the world descend on Ketterdam to root out the secrets of the dangerous drug known as jurda parem, old rivals and new enemies emerge to challenge Kaz’s cunning and test the team's fragile loyalties. A war will be waged on the city’s dark and twisting streets―a battle for revenge and redemption that will decide the fate of the Grisha world." Plot: The story starts right off where Six of Crows ended. Kaz and his crew are trying to find a way of getting Inej back from Jan Van Eck's claws without having to give him the secret of jurda parem, a dangerous drug that enhances Grishas´powers. And, of course, they are also trying to receive the reward they were promised for breaking in -and out- the Ice Court, a heist told impossible. And, because nothing comes easy to these outcasts, there is a price on their heads and everyone -every nation- is after them. As in the first book, the development of the plot is intricate and the story is full of twists and action-packed. There isn't a slow moment and there are so many twists that make your jaw drop -or bring tears to your eyes (how could you, Bardugo? How could you?!). Writing: If you read my Shadow and Bone review, you know I think Leigh Bardugo's writing has evolved since her debut novel. And, Crooked Kingdom just proves that. The quality in the Six of Crows duology is higher than in the first book of the Grisha series; you almost can't believe they were both written by the same person. 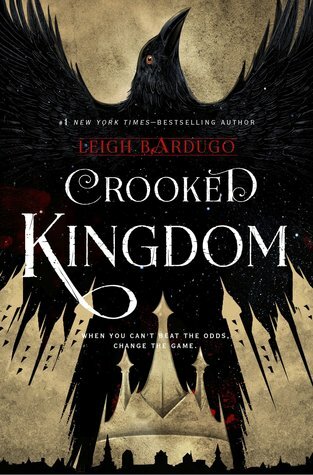 In Crooked Kingdom the writing is very fluid, there is attention to every little detail and the characters are very well-developed. Following different POV's can always be complicated, but Bardugo does is so perfectly that there is no way you can mix up a character to another. Every character -Kaz, Inej, Nina, Matthias, Jesper and Wylan (yes, there were chapters in Wyllan's POV this time)- has their own and unique voice. Characters: What more can I say about the characters that I hadn't said before? Kaz is still vicious and keeps plotting. His cunning mind never stops and he's always a step ahead everyone else. Inej is still the perfect Wraith. I still admire her strength and her faith. And, yes, I currently ship Kaz and Inej a lot more than I already did. Nina, even though she is fighting the effects of taking jurda parem, is the same old same Grisha who loves chocolate cookies and Matthias. And, Matthias is still a soldier at heart, but because of Nina's love has started to understand that not everything is white and black. Jesper is still facing his gambling problems along with Kaz's (kind of ) indifference. But he has Wylan, who we finally get to know a little bit more. He's so much more than a merchling. Worldbuilding: Leigh Bardugo knows how to craft a perfect world. I loved Ketterdam and it will be difficult to say goodbye to its streets full of secrets and dark corners. I guess all I can add is that the worldbuilding is perfectly-flawless. There is only one word to describe the Six of Crows duology: a masterpiece!